Starting in the 1950’s as a writer on Your Show of Shows, Neil Simon punched the typewriter keys with an indefatigable, workman-like output, penning works for Broadway and the big screen through the 60’s, 70’s, 80’s, and 90’s. 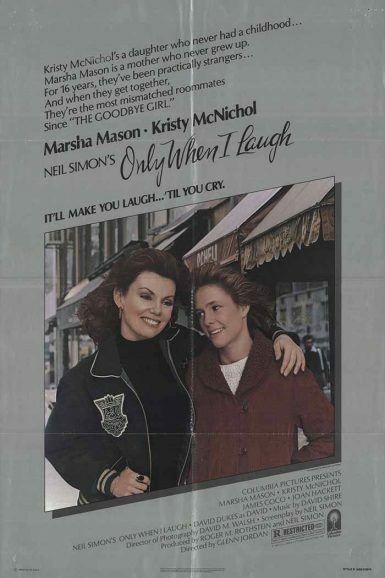 Based on his play The Gingerbread Lady (1970), Only When I Laugh is a dramatic-comedy where family and friends often take a backseat for the love of show business and the bottle – a variation on a favorite Simon theme. In a role that garnered her a Best Actress nomination, Marsha Mason plays Georgia, who’s fresh out of rehab and determined to return to the Broadway stage. Troubles arise when her daughter Polly (Kristy McNichol) asks to move in with her to make-up for lost time caused by Georgia’s alcoholism, and a former flame presents an emotional role for her in his new script, causing her sobriety resolve to rip at the seams. Joan Hackett and James Coco shine in supporting roles as trusted friends (both were recognized with Academy Award nominations), and a young Kevin Bacon makes one of his early “six degrees” appearances. Based on Neil Simon’s successful Broadway play of the same name, I Ought to Be in Pictures poignantly captures a head strong 19-year old, desperately trying to reconnect with her father after 16 years of estrangement. Dinah Manoff reprised her Tony Award winning role as Libby Tucker, who travels unannounced from New York to Los Angeles in order to solicit the help of her screenwriting father Herb (Walter Matthau), so she can make it as an actress. Herb has been less than forthcoming about his past with his make-up artist girlfriend Steffy (Ann-Margret), who has grown tired of Herb’s underachieving and noncommittal ways. Perhaps no other actor brought to life Neil Simon’s witty banter more than Matthau, and fans of his curmudgeonly persona will not be disappointed, although Libby’s yearning to fill in the missing years without a father, eventually softens Matthau around the edges. Director Herbert Ross and one of the most in-demand comedy cinematographers from the 70’s and 80’s, David M. Walsh, captured a smoggy Los Angeles underneath the Hollywood sign that is fun to revisit.